Points, whether manmade or natural, are always prime places to focus your attention in the fall. Shaw Grigsby was easing into casting range of a modest little mud flat that ran out to a tapering point when a hungry bass clearly exemplified his forthcoming explanation. That fish was one of several that followed a nearly identical strategy, which Grigsby said can make the difference between looking and catching. As Grigsby explained, these focus points are less about habitat and more about feeding. Central to this theme is the concept of baitfish redirection – anything that stalls, gathers and collects shad inherently takes them off a straight-line course. Once such changes occur, the bass quickly identify the ambush points, which present clearly discernible casting targets. Grigsby particularly appreciates a point with rock or stumps, as this blended habitat will attract both shad and crawfish. Fall bass are heavily baitfish-focused, but they won’t pass up an easy crustacean snack. Furthermore, when post-frontal conditions stall the action, fish often park next to cover, where craws become a temporary micro-focus that anglers can exploit until stabilizing conditions put the fish back on the baitfish train. The fall drawdown takes a lot of wood and other shallow cover out of play, but any remaining items are fish magnets. Simple supply-and-demand; if a pocket has one laydown with fish-sustaining depth, you can bet the farm it will hold fish at some point in the day. Similarly, docks never lose their appeal, but when fall finds baitfish holding around those deeper ends, this offers prime bass opportunity. Shaw Grigsby found this keeper rounding up bait along a shallow muddy point. 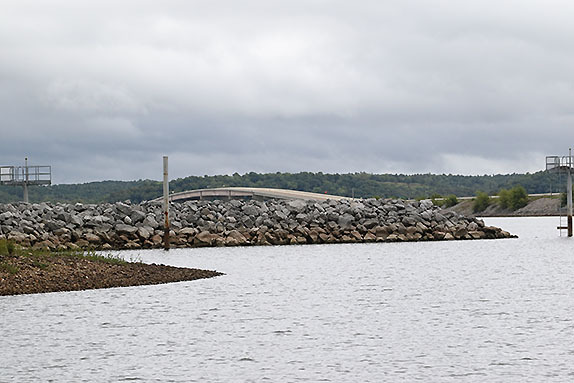 Riprap break walls defending the entrance to a pocket hosting residential property or marinas also offer great potential. With all of these examples, a key element is the feeding opportunities for shad. Algae clinging to rocks, wood, etc. feeds a lot of little mouths, so dial in the shad-friendly spots and you’ll dial in the ones bass like. Now, this concept of specific fall spots extends past the shallow bank-based habitat and includes a lot of open-water stuff, as well. Case in point, a past outing on a prominent spotted bass lake saw these neurotic little hellions giving Aaron Martens a fit. As we worked our way into the mouth of a wide and deep creek, the fish were pushing shad to the surface, tempting long-cast attempts, but ultimately remaining just out of reach. Scooting closer to the action proved to be a lesson in frustration, as each time we tried to sneak closer, the fish would sound and round up another pod of bait further along their migratory course. 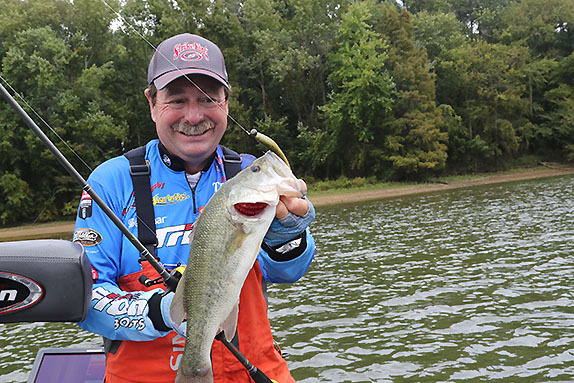 Alabama angler Jimmy Mason agrees and summarizes what he calls “compression zones” – basically, spots where bass can take advantage of a suddenly diminished playing field depth and bottom contour to round up their meals. A classic example is a steep, rocky point where the fish systematically corral schools of bait, drive them against the structure, then launch their assault when the forage runs out of space. As the fish push farther into a creek, they’ll repeat this pattern on each spot they encounter. The game typically starts with a seemingly random encounter, but scan the bottom to find the prominent spots close to deep water and each time you pick up a bait school on side scan, picture where the fish will be coming from and what course would push the bait into that compression zone. Considering the fact that your new crops of shad will still be modest in size, Grigsby follows a simple rule: Small for fall. That means slim-profile spinnerbaits, 1/4-ounce Strike King Redeye Shad lipless baits, KVD 1.0 square-bills and small swimbaits like Strike King’s 3.75-inch Rage Swimmer on a small football head. Small spinnerbaits can be highly effective for fall fish. That rule merits tweaking when gizzard shad abound, or on blueback herring lakes where bass are used to seeing sizable profiles. In either scenario, bumping up your bait profile with larger topwaters like the new Strike King Mega Dog, a big pencil-popper or a full-size spinnerbait can work wonders. Because fish are generally scattered in the fall, it’s easy to get in a hurry and rush through your searches. However, balancing the inherent haste with an appropriate dose of thoroughness is a worthwhile effort. Using his muddy point as an example, Grigsby found most of his bites on the deeper side, but he noted the importance of checking the shallower side and the tapering point, as well as the adjacent flat banks. Think of these sites as highway rest stops and you’ll have a clearer understanding of how fish approach, linger and then depart. 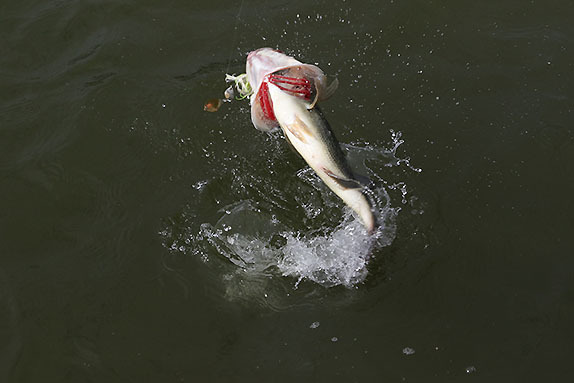 As for casting angles, you want to mix it up so the fish have a chance to see the bait coming from different directions. Do this and you’ll usually establish a consistent preference, but just consider the habitat dynamics and associated hazards. “Coming uphill is a great way to catch them, but it’s also a good way to get hung up,” Grigsby observes. Also worth noting, these specific spots can become heavily timing-dependent; both in the broad sense of seasonal movement and daily development. That could mean a spot that looked good enough to hit on your way into a creek or pocket deserves a parting shot on your exit.